So what are we going to do over the weekend? For many of us it’ll be a lot of nerves and anguish over the rattling of sabres and armored personnel carriers by the Black Sea, and there’s not much we can do about it. Maybe a good time to take store of friends and loved ones, and spare a thought and prayer for all the Crimeans and Ukrainians who want nothing but what we want as well, peace and sunshine and a quiet weekend with their families. It’s anywhere between hard and impossible to figure out what’s going on out there, but our western media sure are not telling us the truth and nothing but the truth. It’s a major propaganda bubble on all sides, and that leaves nothing but losers in its wake. It could still change the map of the world with no turning back, however, and have a lot of blood be shed in fields and city streets as it does. For me personally, it’s an aberration that John Kerry gets to speak for not just the US, but the entire western world, because Kerry is one of Capitol Hill’s army of borderline psycho coneheads who represent interests, not people. The man’s a stooge. Which makes it all the more interesting to see Ron Paul state that Putin has the law on his side. And it makes one wonder why that difference in view in Washington is not debated on the Hill before Kerry moves on to his next meeting to tell the Russians to put up or shut up. If for no other reason than a message like that sounds silly coming from him, and not a single Russian is fooled. But in the meantime this hairdo in search of working neurons could cause a lot of pain for mothers and children who happen to live in the line of fire. And we can say one more time that we expected better from Obama, but that got to sound repetitive and silly a while ago, not to mention devoid of credibility. If things go wrong, there’s no telling what the world’s economies will look like by Monday. There’s so much zombie capital keeping the system afloat today that a mass fear driven kneejerk into what is perceived as safety could wipe out more of it than entire nations are worth. Such a move back into reality would be good on some fronts, but who wants to see lives lost over it? What has been lost a little in translation and hubris is that China has put its voice behind Russia, but there’s no way Kerry and Merkel haven’t picked up on that loud and clear. If they want to play cops and robbers and sanctions and boycotts, they may find they’re shooting their own feet in the crazy house or mirrors they’ve created. And even if the Kiev unrest is toned down at the last minute, there may be so much economic uncertainty shaken loose over the past while that matters start to plummet out of hand anyway. 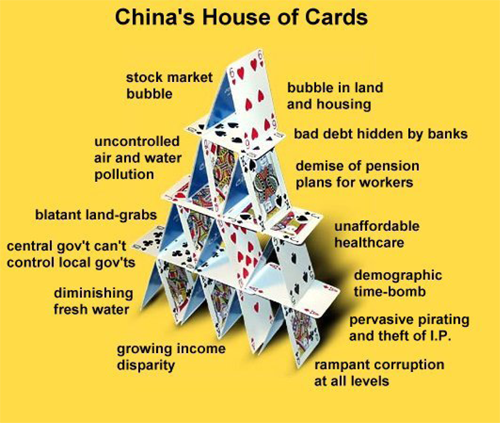 Most pundits keep on claiming that the Chinese government has it all under control, and it’s only trying to reform the system, and isn’t that a great thing, but I’m thinking first of all Beijing has never tried anything like it, and second given the size of shadow banking one really needs to wonder how much control they actually have. From where I’m sitting what happens in China today could just as easily be part of an ordinary power struggle, and moreover one that unfolds while the country has some very serious problems that are unrelated to whatever reform is or is not intended to take place. That 18.1% plunge in Chinese exports is still front and center in my mind when I read the news. That’s a very big number. And when their president and PM try to make it look as if they sort of meant for events to happen as they do, and say all they really care about is creating jobs, I simply don’t see how they’re going to do that with that sort of drop in exports, the one segment in their economy that keeps the whole thing going to begin with. We’re 2 weeks and change away from Japan’s dreaded sales tax rise, and there is just no way those two weeks will not be filled with people taken cover and seeking shelter, be they investors or ordinary citizens. There’s too much risk for everyone but a few daring risk takers. And if the deflationary last twenty years have shown us anything, it’s that the average Japanese is not a great risk taker. So the velocity of money can only go down, and no matter what I read about inflation in Japan, that is a surefire way to get quagmired even deeper in deflation, and Abe’s stimulus to compensate for the sales tax hike won’t change that (it’ll only make that tax hike look stupid, because net revenue will be ridiculously low). How will longer will Shinzo Abe call the shots? Hard to gauge, if only because Japan doesn’t seem to have any other way to go anymore. Unless perhaps it goes for self-sufficiency in a big way, but that’s so not 21st century and globalization and having your politics dictated by the financial system that it’s going to take a big old battle to get there. In Japan like in so many other places. But then I figured there’s no way I can not add Helpless as well. After all, how fitting would you like it? China is the reason so many companies tell you how great their prospects are. TSLA is going to China, YUM and MCD sellso much fast food in China that now Chinese people are getting fat and having heart attacks – just like we do! Casinos make their money in China, luxury goods manufacturers do significant portions of their sales there and, of course, it’s the raison d’etre for the commodities industry. But what if China is a fairy tale and, rather than a decade of growth ahead, we have a decade of stagnation or, even worse, contraction on the other side of the World? As you can see from Dave Fry’s FXI chart (above), the Chinese market has gone nowhere this whole decade – DESPITE the S&P starting 2010 at 1,100 and gaining 68% since then. This morning we got data out of China showing Industrial Production growth slowed to 8.6% from 9.7% measured just a month earlier and no, it wasn’t the weather. Retail Sales fell to 11.8% from 13.6% and Fixed Investments fell to 17.9% from 19.6% and none of those are BAD numbers (still growth, just slower) but, as I pointed out in Monday’s post, bank loans and the bond market there are in no way priced for slower growth. China’s GDP is “only” $8 trillion, a little over 10% of the World’s total. Our GDP is $17 trillion and Europe clocks in at around $18 trillion ($20+ trillion if you include the UK) and Japan is $6 trillion. Russia is $2 trillion, India $2 trillion, Australia $1.5 trillion, Mexico and South Korea are over $1 trillion and then there’s the rest. If the rest of the World is going up 3.5% instead of 2.5%, then we can easily shake off a 2.5% pullback in China – but we have to be VERY SURE we have a good balance going forward. More importantly, we have to be more realistic about the prospects of our corporations and think about whether their sky-high valuations are likely to be realized in a market where growth prospectsin China are no longer infinite. Of course China is a “planned” economy and that means they can keep growing the economy by force if they want to. Last year alone, China bought $500Bn worth of debt from the US to keep the Dollar strong against the Yuan, which keeps the export wheel spinning. 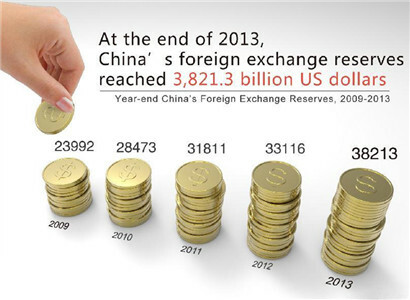 With an $8 trillion economy holding $4 trillion of US debt, China needs to be VERY concerned about our stability, the same way we would be if we held $8.5 trillion worth of Chinese debt. But there’s the real problem – we don’t hold $8.5 trillion, or even $1 trillion of the $100 trillion worth of Chinese debt (see Monday’s post for breakdowns) – that’s owned by Asia and Europe and most of all by the Chinese people, who have been convinced to pour their savings into Chinese Corporate Bonds which never (until now) defaulted. China’s weakest start to a year for investment growth since 2001 and unexpectedly slow industrial production add pressure for economic stimulus, just as Premier Li Keqiang signals he wants to avoid such a move. Li, at his annual press briefing in Beijing yesterday, indicated he’s confident that economic goals for 2014 are within reach. Two hours later, data showed factory output rose in January and February from a year earlier by the least since the global financial crisis, while retail sales grew at the slowest rate for the period since 2004. 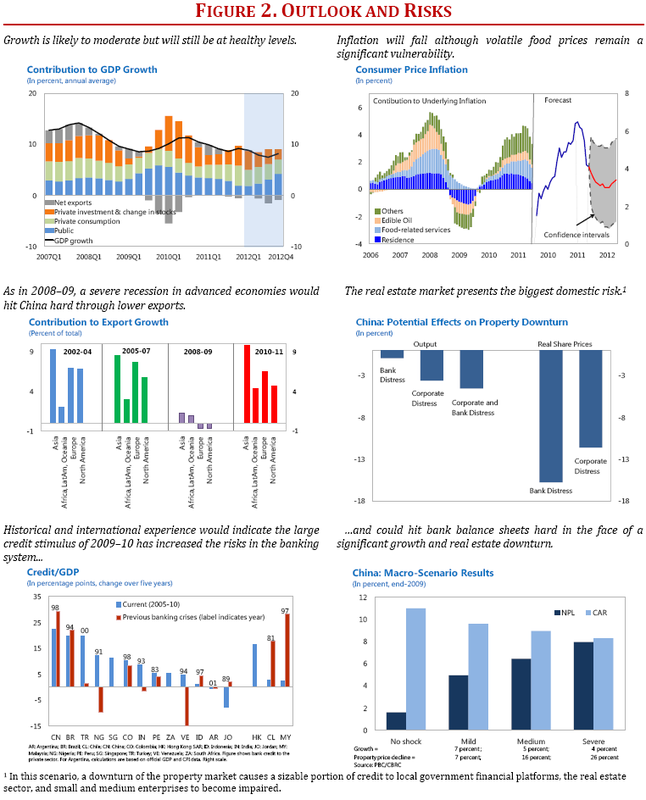 The figures increase chances that China will take steps to boost growth including the first cut in almost two years to lenders’ reserve requirements, according to Societe Generale SA. Any threat to jobs, incomes and a 7.5% growth target could test the leadership’s resolve to curb pollution choking major cities, rein in shadow banking and control risks from a credit boom. “They are serious about reforms and they are serious about protecting the growth target and particularly the employment part of that,” said Tim Condon, head of Asia research at ING Groep NV in Singapore, who previously worked for the World Bank. “We’re close to a decision point” on whether stimulus is needed, he said. A weakening in the yuan this year and declining interbank interest rates indicate the government is already trying to help the economy, according to Bank of America Corp. Its Hong Kong-based economists yesterday cut their first-quarter growth forecast for China to 7.3% from 8% and their full-year estimate to 7.2% from 7.6%. At least five other institutions including Nomura Holdings Inc., JPMorgan Chase & Co., UBS AG, Mizuho Securities Asia Ltd. and Daiwa Capital Markets trimmed their China expansion forecasts following yesterday’s data. China was able to realize last year’s economic targets without using short-term stimulus measures, Li said yesterday. “Why will we be unable to do so this year?” he asked. Ma Jiantang, head of the statistics bureau, said China’s economy is “off to a good start” for the year with major indexes at “relatively high levels,” according to an article in today’s People’s Daily, the Communist Party newspaper. He said he’s confident that China can achieve 2014 targets and that employment in the first two months was “good,” according to the paper. “If there’s a policy response, the response will be selective and restrained, instead of an all-out stimulus,” said Qu Hongbin, chief China economist at HSBC Holdings Plc in Hong Kong. Possible measures including lowering barriers to private investment and speeding up spending on infrastructure such as subways, Qu said. China’s default risk has risen beyond that of Ireland, having been on par with France and Japan a year ago, as Premier Li Keqiang said financial leverage is making the economy’s outlook more complex. Five-year contracts protecting against non-payment on government debt climbed to 99 from 63 a year earlier, almost double the 49 for Japan and 51 for France, CMA credit-default swap data show. That compares with 88 for lower-rated Ireland, which exited a bailout in December. The yuan has lost 1.3% in the past month, the most in Asia, while the Shanghai Stock Exchange Composite Index has declined 5.2%. This year’s 7.5% economic expansion target is “flexible” and some financial product defaults may be unavoidable, Premier Li told a press conference at the National People’s Congress yesterday. A report showed industrial production growth slowed, making it harder for companies to repay debt. Shanghai Chaori Solar Energy Science & Technology Co. (002506) became the first onshore bond issuer to default last week. China’s leaders are wrestling with the fallout from a credit boom that began with a 2008 stimulus package, funded with off-balance-sheet financing arranged by local governments and banks. While those efforts avoided putting strain on state banks and the central government, they are less transparent. Regional authorities, which aren’t allowed to sell debt directly, set up thousands of financing vehicles to raise funds to build subways, highways and sewage works. Their liabilities rose to 17.9 trillion yuan ($2.9 trillion) as of June 2013 from 10.7 trillion yuan at the end of 2010, according to National Audit Office data. China’s $6 trillion shadow-banking industry, which includes trust companies and wealth management products issued by banks, was rated the nation’s biggest challenge in a Bloomberg News survey of 29 economists before the annual meeting of lawmakers started March 5. In January, a near-default was averted when a 3 billion yuan China Credit Trust Co. product that lent money to a collapsed coal miner was bailed out. Jilin Province Trust Co., which missed five interest payments on a similar security, declined to comment on the sixth installment that was due this week. The world’s most-profitable banks have never been so unloved by stock investors. China’s four-biggest lenders, which reported $126 billion of earnings in the 12 months through September, sank to the lowest valuations on record in Hong Kong trading yesterday. The MSCI China Financials Index dropped to an almost decade low versus the global industry benchmark while the market value of Industrial & Commercial Bank of China Ltd., the nation’s largest lender, fell below net assets for the first time on March 12. The state-controlled banks known as China’s Big Four are getting squeezed by slower economic growth and rising bad debts just as policy makers open up the nation’s financial system to non-government competitors. Their shares have lost $70 billion of value this year, equivalent to the size of New Zealand’s entire stock market, even as U.S. and European peers rally. Wells Fargo & Co. and JPMorgan Chase & Co. have knocked ICBC from its ranking as the world’s biggest bank by market value. ICBC, China Construction Bank, Agricultural Bank of China and Bank of China were stock-market darlings as recently as 2011, when the world’s second-largest economy was growing at close to 10% and banks reaped profits from a $3 trillion lending spree during the previous two years. Now investors are concerned that those loans will turn sour at an increasing rate as growth slows toward 7.5%, the weakest annual pace since 1990. At the same time, the ruling Communist Party’s plan to increase the role of markets in China poses a threat to state-owned banks that have benefited from tightly regulated interest rates. Central bank Governor Zhou Xiaochuan said on March 11 that the government will free up deposit rates within two years, while the China Banking Regulatory Commission said the same day it has approved a trial program to establish five privately-owned banks. The crisis escalated into a conflict between the U.S. and Russia after the West supported a coup, then lied by violating the Feb. 21 agreement when it recognized the formation of a new and illegitimate government of extremists. This conflict has the potential of sparking a new Cold War — something I never thought could happen in modern times since I believed it would have to be rooted in ideological differences. Instead, Moscow and Washington have billions of dollars of economic interests at stake, making this a geopolitical rather than an ideological Cold War. Russia is not in Crimea to expand its territory but to oppose the immense power of West and its financial institutions in New York and London. Washington wants to characterize this as a conflict between Moscow and Kiev, thereby forcing Russia to negotiate with an illegitimate regime determined to destroy everything Russian in Ukraine. However, everyone understands that this is a conflict between Moscow and Washington and that these countries should negotiate a solution. The question here is not Crimea but which reality the two sides are prepared to accept. Should Moscow allow Washington to force it into humiliating submission and accept the possibility of a violent overthrow of the Putin regime? Or should Washington acknowledge that it can no longer impose its will on others? Both sides are unwilling to admit their weakness, thus making a geopolitical Cold War likely. The West will hit Russia with economic sanctions to pressure Russian oligarchs into forming a fifth column, just as it did in Ukraine. To avoid this, Moscow will have to force oligarchs to bring their overseas assets back to Russia. If Washington wins this geopolitical Cold War, it will install a pro-Western government in Moscow which could lead to the breakup of Russia. Siberia, the Caucasus and the Far East will demand autonomy, and the country’s oil and gas resources will be transferred from the government to multinational corporations. When you use terms like fascist and neo-nazi again and again, you’re going to lose my attention. We want facts, not slurs. A few weeks before the Feb. 24 coup, U.S. Assistant Secretary of State for European and Eurasian Affairs Victoria Nuland, then in Kiev to support the anti-government protests, was recorded calling for Yatsenyuk to become the new leader. Yatsenyuk is a banker, very Western-oriented, and seen as sure to accede to the demands of the International Monetary Fund and the international banks for austerity measures in exchange for a “bailout” of the Ukraine’s debt. In addition, Yatsenyuk is not from an overtly fascist party, a major public relations advantage for Western imperialist backers of the new regime. Parubiy’s deputy is Dmytro Yarosh, who was the leader of the fascist Right Sector’s para-military forces in Maidan. In a recent BBC video, a Right Sector leader said: “National socialist [Nazi] ideas are popular here…We want a clean nation, not like under Hitler, but a little bit like that.” The new Defense Minister is Ihor Tenyukh, former head of the Ukrainian navy and from the Svoboda party. Oleksandr Sych, also from Svoboda, is one of three Vice Prime Ministers. Another key post held by an open Svoboda member is that of Prosecutor-General. Oleg Makhnitsky is now the equivalent of Attorney General in the U.S., and has immediately set out to indict the leaders of Crimea who do not want to live under the new order in Kiev. Svoboda also holds the ministries of ecology and, especially critical in the Ukraine, agriculture in the new government. Though not named as a government minister—clearly by choice—Oleh Tyahnybok is the leader of Svoboda, of which he was also a co-founder when it was known as the Social National Party. Now he is one of the most powerful figures in the country. While Tyahnybok sought to moderate Svoboda’s public image beginning with the name change in 2004, a speech he gave the same year showed just how paper-thin that cover was. Speaking at memorial to a commander of the Ukrainian Insurgent Army (UIA) that collaborated with the Nazis and massacred tens of thousands of Poles, Jews and communists, he called for Ukrainians to fight the “Muscovite-Jewish mafia” which he claimed were running the country. Tyahnybok praised the UIA and the Organization of Ukrainian Nationalists led by Stepan Bandera, who “fought against the Russians, Germans, Jews and other scum who wanted to take away our Ukrainian state.” (For the terms “Russians” and “Jews,” he substituted extremely derogatory slurs). I don’t know how real this report is. But neither do I know about reports that claim the opposite. Furthermore the former security chief believes that Parubiy has been in contact with US Special Forces that could have coordinated the assault. “Shots came from the Philharmonic Hall. Maidan Commandant Parubiy was responsible for this building. Snipers and people with automatic weapons were ‘working’ from this building on February 20. They supported the assault on the Interior Ministry forces on the ground who were already demoralized and have, in fact, fled,” Yakimenko said in an interview with Russian television. The police officers were chased by a group of rioters armed with various weapons and at that point, Yakimenko says snipers fired at pursuers themselves. “When the first wave of shootings ended, many have witnessed 20 people leaving the building,” former chief says, noting that they were well-equipped and were carrying military style bag for carrying sniper and assault rifles with optical sights. Not only the law enforcers, but people from the opposition’s Freedom, Right Sector, Fatherland, and Klitschko’s UDAR party have also seen this, Yakimenko claims. Yakimenko claims that Parubiy was part of a group that was heavily influenced by the people associated with the US secret services. “These were the forces that carried out everything that they were told by their leadership – the United States,” Yakimenko explained, claiming that Maidan leaders practically lived in the US embassy. RBS should have been cut into little bite size bits long ago. Instead, here’s more taxpayer money circling the drain. Royal Bank of Scotland has edged closer to junk bond status after a leading credit ratings agency downgraded the state-controlled bank’s debt following record losses and fears of regulatory punishment. Moody’s also warned of further downgrades as it expressed concern about the bank’s plan to revive its fortunes in the wake of a £8.24bn loss in 2013 – its sixth successive year of losses. RBS has reportedly suspended three currency traders as regulators around the world continue their investigation into potential rigging of the £3tn-a-day foreign exchange market . The Bank of England governor, Mark Carney, said this week that the forex investigation could become a larger scandal than the manipulation of Libor, the benchmark interest rate. Meanwhile, in January, the 81%-taxpayer owned lender warned of a further possible £3bn in costs from litigation relating to mortgage-backed securities, payment protection insurance and interest rate hedging products. The new RBS chief executive, Ross McEwan, – who has described his employer as “the least trusted bank in the least trusted sector in the marketplace” – outlined his plan to return the bank to profit when he revealed the latest losses at the end of February. The strategy includes refocusing on the UK rather than global customers and shrinking the bank from its seven businesses to concentrate on just three: personal and business banking, commercial and private banking, and corporate and institutional banking. Delivering its verdict on the plan, Moody’s said it could “heavily depress profitability over the next few years”. Moody’s had warned RBS last month that it was considering downgrading its debt, which is effectively a corporate credit rating and determines the interest rate at which businesses can borrow. China exports are down. Japan exports are down. UK exports are down. Any questions? Britain’s trade position worsened in January, as diminishing demand for British goods abroad triggered a fall in exports. The trade in goods deficit – exports minus imports – widened to a worse than expected £9.8bn in January from £7.7bn in December, according to the Office for National Statistics. The government’s ambitions to rebalance the economy away from debt-fuelled spending and towards exports were disappointed by a 4% fall in exports in January to £24.2bn. Imports however increased by 3.4% to £34bn, as an improved economic backdrop boosted domestic demand for foreign goods. Part of the weakness in the UK’s trade position in January could be explained by distortions of erratic items, in particular strong imports of aircraft. While imports from the European Union – Britain’s biggest trading partner – were flat at £18bn, imports from outside the EU jumped 7.5% to £16bn in January. Goods exports to the EU fell by 3.7% to £12.2bn, while exports to non-EU countries fell more sharply by 4.3% to £12.1bn. The broader trade in goods and services also widened sharply to £2.6bn in January from £700m in December. In 2012 the chancellor, George Osborne, set a target of doubling UK exports to £1 trillion by 2020. However, UK exports have remained flat since mid 2011 according to the ONS, reflecting continuing difficulties in many economies as the impact of the global financial crisis is still felt. Brighter news on the UK economy came from the construction industry, with separate data from the ONS showing output in the sector rose by a better than expected 1.8% in January compared with a year earlier. GE’s finance unit was declared too big to fail a few years ago. It should have been eliminated instead. See how the NY Times phrases this? “… the Financial Stability Oversight Council has designated the lender as a systemically important financial institution, subjecting it to greater regulatory scrutiny.” As if being too big to fail means you get to be watched all the time. And people still call that a quality paper?! General Electric filed on Thursday to spin off its North American retail finance unit in an initial public offering, taking the next step to reduce the size of its GE Capital division. In a filing with the Securities and Exchange Commission, the business, which handles store cards for the likes of the Gap and Walmart, said it planned to rename itself Synchrony Financial. The move is intended to help the conglomerate downsize GE Capital, which had been one of the biggest moneymakers for the conglomerate since the era of Jack Welch. At one point, GE Capital brought in just under half of all G.E.’s revenues. But it ran into trouble during the financial crisis because of its huge holdings in both commercial loans and, thanks to a subprime lender it had purchased, risky home loans. In the immediate wake of Lehman Brothers’ collapse, shares in G.E. plummeted, as concerns grew about the company’s ability to support its financial arm. Since then, G.E. has aimed to become less reliant on GE Capital, transforming it into a smaller, stable industrial lending business. Even so, GE Capital remains an enormous institution. Last year, it reported $44.1 billion in revenue, or about 30% of its parent’s overall consolidated revenue. The federal government’s Financial Stability Oversight Council has designated the lender as a systemically important financial institution, subjecting it to greater regulatory scrutiny. The number of countries declaring themselves in favor of shale keeps rising, the EU even voted to keep shale out of new environmental laws. But Big Oil is massively ditching their assets. Who, oh who is right? Royal Dutch Shell will cut spending by a fifth and lay off staff at its American exploration and production business, the company said on Thursday, in another sign that oil majors are struggling to profit from the booming U.S. shale sector. Oil and natural gas pumped from North American shale have proved a boon for many smaller energy businesses, but the world’s biggest oil companies, including BP and Exxon Mobil, have had less success unlocking the prolific rock’s full potential. London-based BP announced last week that it is to spin off its onshore U.S. oil and gas assets into a separate business to improve performance. “Financial performance there is frankly not acceptable … some of our exploration bets have simply not worked out,” said Ben van Beurden, who was head of refining before being promoted to Shell’s top job at the start of the year. Oil companies active in North American shale have broad exposure to profit-sapping U.S. natural gas, prices of which fell to their lowest in a decade during 2012 but rebounded as a cold winter depleted gas in storage. Sentiment on the outlook for the fuel is improving with the prospect of liquefied natural gas (LNG) exports and increased industrial use, but uncertainty remains. The spending cuts announced on Thursday follow Shell’s decision in January to suspend its controversial Arctic drilling programme and pledge to cut capital expenditure and streamline operations worldwide after the company’s least profitable fourth quarter in five years. “I don’t think it is a matter of trying to reinvent the company in a fundamentally different way; it is a matter of tackling some of the issues that we know need tackling,” van Beurden told journalists on a conference call after Thursday’s strategy update. The Anglo-Dutch oil major is sticking to its 2014/15 asset divestment target of $15 billion, of which $4.5 billion has already been announced. It also said that it is too soon to say whether capital expenditure will decline next year from the planned $35 billion this year. Shell, which is already selling more than 700,000 acres of U.S. shale assets, said it will cut permanent staff and contractors in North American onshore oil and gas exploration by 30 percent. The intent is to reduce headcount this year by about 400 Shell staff to about 1,400 people, many of whom will be redeployed to higher priority projects, a Shell spokeswoman said. The number of contractors working in this area for Shell is smaller than the number of permanent staffers, she added. The company last year lost $900 million in its upstream Americas unit. Shell owns shale gas acreage in the Mercellus shale in Pennsylvania, Texas, Colorado and Kansas, more of which it said it may have to sell. Besides the Americas, global downstream operations also remain a drag on business because of low refining margins as well as oil theft in Nigeria that cost the company close to $1 billion last year. Shell is also involved, together with Exxon Mobil, Total, Eni and KazMunaiGas, in the giant Kashagan oil field in Kazakhstan, which has been plagued by start-up problems. Shell said the field had the potential of generating $1 billion in annual cashflow for the company but acknowledged that the production outlook remains unclear. Van Beurden added that Shell operations in Ukraine, where it has a number of pump stations and early exploration works, have not been affected by the country’s dispute with Russia and that Moscow’s intervention in Ukraine has so far had no impact on the company’s investment decisions in Russia. “The map is not the territory”. And Alan Greenspan is neither a good human being nor a smart one. In Alan Greenspan’s recently published book, he argues that the economist’s assumption of rationality is inadequate to describe human behaviour, and that banks that are too big to fail are too big. These are not novel opinions; what is – mildly – significant is that it is Mr Greenspan who is expressing them. The former US Federal Reserve chairman also claims that government spending on Social Security and Medicare, the healthcare programme for the elderly, is drawn more or less dollar for dollar from business investment. And he thinks that economic forecasting is difficult. Perhaps the most interesting thing about the book is the title. Why is it called The Map and the Territory ? I could not find reference to map or territory in it. And I was looking for such references, because more than two years ago I wrote an essay on the state of economics called “The Map is not the Territory”. Mr Greenspan did not refer to that essay. Nor, more strikingly, did he refer to another book published the previous year with exactly Mr Greenspan’s own title. But perhaps that is not surprising. The original The Map and the Territory was written in French (although an English translation is now available). The novel won the Prix Goncourt, France’s most prestigious literary award, in 2010. The choice was controversial. Some described the work as pornographic, others said it was plagiarised. The book has many odd aspects; one is that the author, Michel Houllebecq (real surname: Thomas), not only features in the novel himself but is also brutally murdered. Mr Houllebecq has described the erosion of relationships, particularly sexual ones, by the free market as a central theme of his writing; the book is not a work one might to expect to find on the bedside table of a prominent American conservative. But neither Mr Houllebecq nor I can – or did – lay claim to originality in our titles. The phrase “the map is not the territory” was coined in the 1920s by Alfred Korzybski, the Polish philosopher. The essence of Korzybski’s thought is that we interpret the world through abstractions, abstractions that should not be confused with “the world as it really is”. There are many different possible maps of the same territory, each useful for specific purposes – and the only completely realistic map, one that exactly reproduces the whole territory, is of no practical value at all (a theme developed in Jorge Luis Borges’ essay, “On Exactitude in Science”). Korzybski’s thought has profound implications for economics and related subjects. No economic model can describe “the world as it really is”; there are only provisional approximations that can be pragmatically applied in particular situations. Many economists struggle to accept this. They suffer physics envy, believing (I think wrongly) that physicists employ models that do describe “the world as it really is”. If economics is to be a science, these economists think, those who practice the subject must identify truths that are similarly independent of time, place or context. And Mr Greenspan appears, on the evidence of his book, to be among that group. He now professes a humility not, perhaps, evident in his pronouncements as chairman of the Fed. But he still pursues the quest for a model that might describe “the world as it really is”. He acknowledges that “producing a fully detailed model is beyond the scope of this book”, further conceding that “we may never approach the fantasy success of either the Oracle of Delphi or Nostradamus”. But he assures us: “Most of our intuitive insights, when subject to the discipline of a syllogism, apparently do conform to reality.” Despite everything, he clings to the notion that valid economic policy conclusions can be deduced from a priori axioms about the nature of the economic world. At first sight the two authors of The Map and the Territory, Mr Greenspan and Mr Houllebecq, could hardly have less in common. Yet perhaps they share an underlying superficiality of thought concealed by a complexity of expression. Both the American central banker and the French novelist are applauded within their own culture and derided outside it. But the chairman of the Fed can do a great deal more damage than the winner of the Prix Goncourt. For a growing number of Americans, there may never be such a thing as real retirement. “The market is filled with people who are petrified of the idea of retiring because they might not have the funding to afford retirement,” Goalinvestor.com’s Melissa Doran Rayer, whose company provides financial planning services and created a data chart to show how retirement trends are shifting, told Yahoo News in a recent interview. From 1990 to 2010, the percentage of workers 65 and older staying in the job market rose for both women (from 28.2 to 43.8%) and men (52.5 to 65.3%). Interestingly, those trends have occurred in the 35-plus years since the Revenue Act of 1978 was passed, allowing workers to invest tax-deferred savings in 401(k) plans. There have also been broad cutbacks to pensions across the U.S. A recent analysis found that more than 20 million American workers could have their retirement threatened from pension mismanagement. The percentage of companies offering pension plans has also declined, as have the average retirement contributions in corporate 401(k) plans. In February, AOL’s CEO Tim Armstrong faced wide criticism for his plans to both alter and scale back company 401(k) contributions. There’s also the risk that people will plan poorly for their retirement, choosing either to retire too early or to spend too much when they need to be living on a more modest budget. For example, a new online test about Social Security, which found that about only 5% of respondents correctly answered a set of basic questions about when and how to best use their retirement funds. “There are two or three key mistakes — people planning for too early a retirement or too lavish a retirement,” Tash Elwyn, president of Raymond James & Associates, told USA Today. “It might mean that you’re working part-time or that you’re starting a new business,” Doran Rayer said. And for some, starting a new business is obviously a positive choice. But she said it can also be the only option for some older workers struggling to find a place in a workforce that has largely left them behind. Money quote: ‘What little awareness there is about the “Transatlantic Trade and Investment Partnership” (TTIP) could be distorted by anti-globalization protesters, EU ministers have warned. ‘. Here’s hoping hormones can break the deal, but with little conviction. Europe’s reluctance to buy hormone meat or genetically modified food from the United States has exposed an “enormous gulf” that threatens the world’s biggest trade pact, industry and labour groups told EU and U.S. negotiators on Wednesday. Eight months into talks to create a transatlantic pact encompassing almost half the world’s economy, divisions remain over opening up to each others goods, rules governing the names of foods and genetically modified food. “There is an enormous gulf between the EU and U.S. positions,” said Michael Dolan, a lobbyist for the U.S. Teamsters union, who rejected the idea that the European Union should be the only market to call Greek-style cheese ‘feta’. He warned that a trade deal “is likely to be smaller, more modest than its ambitions, because of so many intractable issues,” telling negotiators in a forum also open to reporters. Tensions over food, which have bedeviled many trade talks around the world, risk eroding already fragile public support for a deal that proponents say would increase economic growth by around $100 billion a year on both sides of the Atlantic. Negotiators aim to finalize a deal by the end of this year. Mindful of the huge protests surrounding global trade talks in the 1990s, EU and U.S. negotiators holding a fourth round of talks this week in Brussels took the unusual step of not only receiving lobbyists but also letting in the media. What little awareness there is about the “Transatlantic Trade and Investment Partnership” (TTIP) could be distorted by anti-globalization protesters, EU ministers have warned. At risk is a pact creating a market of 800 million people where business could be done freely, building on the almost $3 billion of transatlantic trade in goods and services each day. Difficulties over agriculture bode poorly for the talks because EU-U.S. negotiators are seeking a far more a sophisticated agreement, going beyond farm goods to bring down barriers across all industries and businesses. Even animal welfare is sensitive in a proposed accord where both sides would recognize each others standards to oil the wheels of commerce. Europeans said they consider U.S. standards concerning the slaughter of animals as being far lower than in the EU. The folks who take the decisions are of the techno happy bent that says we much and will and can reinvent the entire planet. They never tire of pointing out how smart man is. As the whole shebang is falling apart. If anything, they love to see it all crumble and die: that way we’ll have no choice but to make it all one big lab. There is no bigger threat to mankind and to the planet, but it all falls under optimism. The plant science experts who wrote the report, backed by the Walport, argue that decades of use of GM crops around the world have revealed no adverse effects. They say the UK should forge ahead with GM crops to help secure future food supplies, ensure UK farms do not become uncompetitive and benefit the UK’s knowledge economy. GM crops are now grown on 12% of all the world’s arable land but are barely used in the EU following years of public concern. “The process takes years and costs millions of euros for each crop. Not surprisingly, there are very few applicants,” said the report’s lead author, Professor Sir David Baulcombe, at the University of Cambridge. The report notes that the EU imports 70% of its animal feed, most of it GM, and, in an article for the Guardian, Baulcombe notes: “Bizarrely, our animals eat GM quite safely although we do not have the option.” The report backs the conclusion of the European Academies Science Advisory Council that “there is no rational basis for the current stringent regulatory process”. Claire Robinson, editor at campaign group GMWatch, said the report’s authors were not independent of the industry with, for example, lead author Baulcombe receiving research funding and working as a consultant for the multinational Syngenta. “Their views should be treated with the same scepticism we would apply to any sales pitch,” she said. Sometimes you get to think the industry has already won this one. The increased production of genetically modified crops around the world has led to a higher number of incidents of low levels of GMOs being detected in traded food and feed, according to the Food and Agriculture Organization of the United Nations (FAO). The incidents have led to trade disruptions between countries with shipments of crops being blocked by importing countries and destroyed or returned to the nation of origin. In the first survey of its kind, 75 out of 193 FAO member countries responded to questions on low levels of GM crops in international food and animal feed trade. -The highest number of incidents involved linseed, rice, maize and papaya. “The numbers of incidents are small relative to the millions of tonnes of food and feed traded every day,” said Renata Clarke, FAO senior food safety officer in charge of the survey. Still, FAO decided to conduct the survey because the resulting trade disruptions may be costly, she said. The trace amounts of GM crops become mixed with non-GM food and feed crops by accident during field production, as sometimes happens when a field trial of a GM crop is grown near a non-GM crop, or in processing, packing, storage or transportation. Since there is no international agreement defining or quantifying “low level,” the interpretation varies from country to country. In many countries it is interpreted as any level at which detection is possible, while in other countries case-by-case decisions are taken on what level is acceptable. Canada’s right wing Anglo-Saxon model continues to do the all the harm it can. It will take so long for people to find out just how harmful, that the “leadership” get away with it. Canada’s efforts to combat climate change could be scaled down as Environment Canada braces for more budgetary belt-tightening over the next three years. A recently released report on Environment Canada’s plans and priorities reveals the department plans to reduce spending from $1.01 billion in 2014-2015 to $698.8 million in 2016-2017. While the report noted current fiscal year’s spending is somewhat inflated due to a one-time payout, the department is still projected to spend about $162 million less in 2016 than it plans to in 2015. Spending on the department’s climate change and clear air program is projected to decrease from $234.2 million this year to $54.8 million in 2016-17. “Outcomes of such decisions would be reflected in the department’s future budget exercises and estimates documents,” the report noted. The Star requested an interview with Environment Minister Leona Aglukkaq’s office to discuss the report. In response, Environment Canada reiterated that the planned spending decrease is largely due to temporary programs that could be extended, altered, or enhanced — depending on the government’s direction. Nevertheless, the department’s report anticipates lean times to come. The report projects Environment Canada’s full-time equivalent positions — the common measurement for federal departments’ workforces — to decrease to 5,348 in 2016-17 from 6,400 this year. I fully agree with the topic. We’re notoriusly inept at doing things for future generations anyway. The environmental movement, of which I am part, has long relied on the crutch of protecting the environment “for future generations.” While it is a valid and important reason to invest time, money and energy into natural resource management, there is a much more compelling and urgent motive for protecting the environment, and all of the majestic species and vital ecosystems that are contained therein: current generations. The future, for billions of people, is a luxury. Today matters, tomorrow matters and the path from today to tomorrow is uncertain for so many people, especially for the 60 percent of the world’s poor that rely on natural resources for survival, most of whom are women and children. As their environment collapses, their day to day existence becomes less certain. As the environment becomes degraded due to things like deforestation, destructive fishing practices and pollution, impacts on people’s lives and livelihoods mount. For example, forests protect soils. When trees are cut down the top layer of earth, that is vital for growing food, is washed away by rain or blown away by the wind. Yes, this undermines important habitat for beloved and necessary species such as impressive gorillas and spectacular birds, but it also translates into food shortages that cause malnutrition in children and jeopardize maternal health. When children are hungry and mothers are dying, people turn to acts of desperation including the slashing and burning of more forests. This cycle is in no way sustainable, but it puts food on the table today. Similarly, water is increasingly hard to find and when it is found it is often contaminated. Rivers carry pesticides, silt and sand and human waste downstream and when the river meets the sea, dead zones erupt wherein no plants or animals survive. But contaminated water is also killing children and is, in fact, the second most common cause of death in children under the age of five. The collapse of food and water supplies is driven not only by local actions but also by changing climactic conditions. And let’s be clear, the term “changing climactic conditions” is not a futuristic sci-fi fantasy buzzword. It is a here and now reality for billions of people. Right now I am sitting in the middle of Kenya’s rainy season and, simply put, there is no rain. When the dry season comes, there is often flooding. Seeds do not grow where they have always grown and farming practices that have always worked do not work anymore. Food and water shortages grow longer, less predictable and more calamitous. Phytoplankton and zooplankton capture CO2 and make it move to the ocean bottom through their feces. Less CO2 in the atmosphere? No, because eventually it gets pumped back up again. And of course, CO2’s acidification effects that break down skeletons should be taken into account as well. 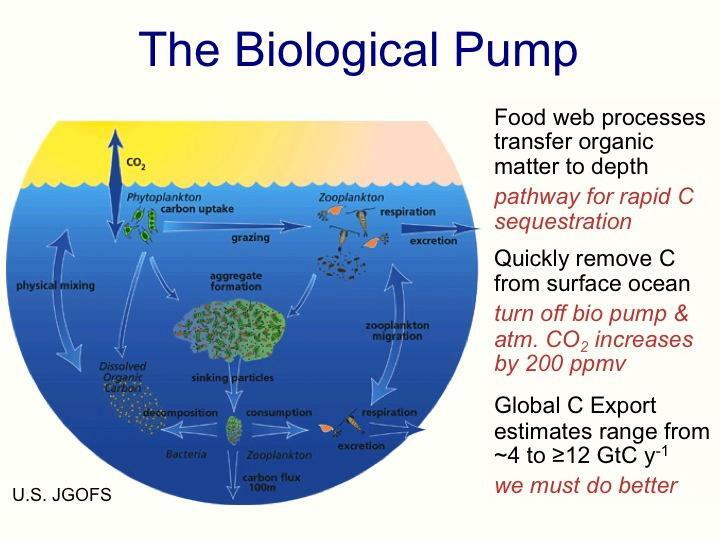 What the biological pump does is make sure CO2 is spread through the entire ocean, does the damage it does, and then gets back into the atmosphere. A team of researchers from the University of California Santa Barbara has conducted a new study, which uses observations from space to help analyze how ocean life plays a role in the global carbon cycle. The researchers studied the life cycle of phytoplankton and zooplankton, tiny microscopic organisms usually found at the bottom of the ocean food chain, and incorporated their life cycle into a new model for assessing carbon emissions from the world’s oceans. The researchers’ food web-based model used satellite data to observe how phytoplankton produce organic matter using carbon dioxide in the water. As part of the study, published in the journal Global Biogeochemical Cycles, the researchers focused on the ocean’s biological pump, which exports organic carbon from the euphotic zone — the depth of the water in the ocean that is exposed to sufficient sunlight for photosynthesis to occur. According to the researchers, the biological pump exports carbon through sinking minute particles largely from zooplankton feces and aggregates of algae. And, once these particles leave the euphotic zone, sinking into the ocean depths, the carbon can be confiscated for as little time as a season or as long as centuries. Carbon is present in the atmosphere and is stored in soil, oceans and the Earth’s crust. Any movement of carbon between — or in the case of the ocean, within — these reservoirs is called a flux. Based on the study’s results, the researchers predicted a mean global carbon export flux of 6 petagrams, or Pg, each year. [ Ed: The current global carbon export flux caused by sinking particles in oceans stands at 6 petagrams per year. A petagram is a quadrillion grams, or about 1.1 billion US tons. Annual global carbon emissions from fossil fuels stands at about 9 petagrams. ] According to scientists, this is a huge amount, and it is roughly equivalent to the annual global emissions of fossil fuel. Currently, fossil fuel combustion represents a flux to the atmosphere of approximately 9 Pg every year. “We need to understand where carbon goes, how much of it goes into the organic matter, how that affects the air-sea exchanges of CO2 and what happens to fossil fuel we have emitted from our tailpipes,” Siegel said. This topic contains 10 replies, has 5 voices, and was last updated by Carbon waste life form 5 years, 1 month ago. It’s been proofread by a scientific illiterate. What is journalism coming to! By their reckoning I weigh 80 Pg which is around 14 times the mean global carbon flux! Or is it: One petagram means 10 to the fifteenth power, i.e. 6 petagrams is equal to 6 billion tons. There is an astrological storm front moving through this world in April, reaching a climax in the third week of April. Technically it is called a Mars Jupiter Pluto Uranus Grand Cross. It is the most stress and strain riddled astrological significator that I have observed. It is rather unlikely that it will not coincide with many manifestations in the human realm of experience. Dangers in foreign countries, dangers from foreign wars. Power struggles involving political and military matters. Attempts to dominate or control others backfire. Given the temporal proximity to the Ukraine clusterfunk, rapid escalation would seem reasonable. Unstable get rich quick schemes blow up. Unexpected financial loss in joint finances and corporate business. Conflicts in the financial affairs of groups and orgasnisations. The desire to overthrow existing power structures, coupled with the tendancy to rash and impulsive actions and outbursts of temper could lead to violent mobs and crowds, even revolution. Seperations and breakdowns in relations. Pentagram = 10 raised to the fifteenth power. there is definitely something in the air this weekend. Petagrams, pentagrams. Think I’ll stick with plantagrams. Least I can eat the end product. Things in the air, for sure, a lot of Jet-A being consumed by the Warmist DoD and POTUS at the Airshow at the Marine base this weekend. Must be CO2 Exempt? With AlGorrythemic CC paid protection. Good for the garden, too. The financial world absolutely does not need this trouble. My admittedly crackpot analysis has always centered on the transfer of sovereignty and power to corporations and away from governments/nations. All done through the partnership with democratic governments via the shared interests of the players within governments and the triumph of neo liberalism. Still there are frictions. Forces and power within governments always have a contingent that draws on nationalism/militarism and what I call Grand Global Strategic thinking.To the extent this generates a lot of business for corporations then they are good with it but when it goes to real conflict then they get sad. JPM may have been happy to help ‘privatize’ Ukraine but they don’t want some big fight to get the opportunity. There are of course many ways to make a narrative about these events but I think this one may be useful. Oh oh, now NASA is getting in on the act. Nasa-funded study: industrial civilization headed for ‘irreversible collapse’? says the headline. As if.Setting aside the politically impossible first part the second part is a sort of definition of collapse in itself. Functionally for most people it would be collapse. If ever I try to explain to anyone that growth has to stop (and ideally go into reverse) and wealth gap acceleration has to stop (and ideally go into reverse) to avoid collapse, they look at me like I’m crazy, yet it all makes sense, clear mathematical sense. Charming psychopaths like Boris Johnson say otherwise, and the frame of reference, the space for “reasonable” debate moves further away from sustainability. He’s a prize a-hole isn’t he, like Thatcher was! What I object to is the idea that the only way that somebody of high IQ can contribute to society is by gaining power and using it to concentrate wealth for themselves. The complete reverse is true. I guess I have a higher IQ than Boris and his friends, or maybe I’m just nicer. Would not be hard!